Providing methods to assist with communication and cooperation between departments. Clarifying requirements of the P2 & GH program. Providing options for program implementation that considers cost, effectiveness and efficiency. Describing and illustrating implementation methods of the P2 & GH program. Determining MS4 concerns and needs for P2 & GH. The GH & PP group is open to anyone. Meetings are typically held quarterly via conference call and in person at the INAFSM annual conference. Please contact the group chair to be added to the mailing list for announcements. Contact the Chair if you have comments on these materials or a suggestion on an issue you would like the Group to address. This document is a Guide for developing or enhancing a P2 & GH Program for various sizes of Phase II MS4s. The Guide describes the program requirements and implementation options for Minimum Control Measure 6 of Rule 13. Download Version: February 2016 Download the entire Guide. To review specific sections, click on the section link below. 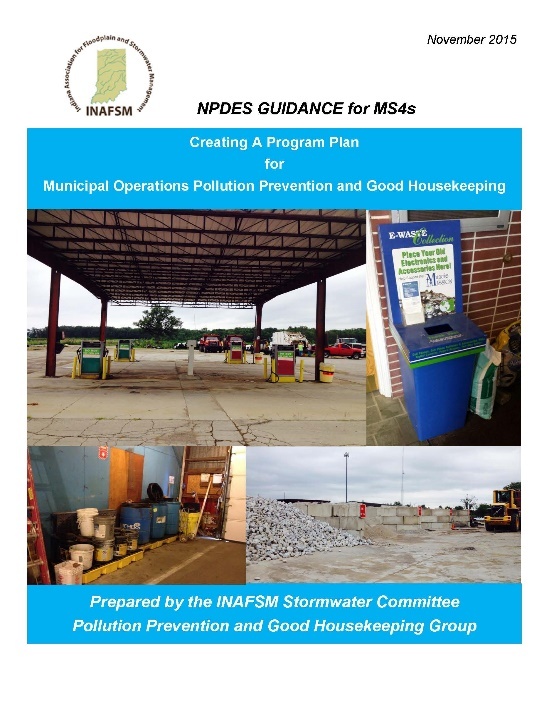 This document was developed to assist MS4s in implementing stormwater plans for municipal departments. The plan is formatted so the coordinator can select the activities that occur at each site. The purpose of the Management of Dumpsters & Trash Fact Sheet is to provide information on the proper management, handling, and good housekeeping practices for trash bins, dumpsters, and roll-off containers. The Fact Sheet can be used by a MS4 for the education of residents, businesses, and industries. An editable Word document is available for adding your local MS4 or utility logo and contact information. The purpose of the posters is to provide municipal employees continuous education by posting in an area frequently visited. These are formatted to print on 11x17 and are editable. The base of the slides can be changed through View>Slide Master. This is where an MS4 would add their logo and contact information. If the MS4 wishes to change pictures and text, those are editable in each slide. They would just have to format it to fit.